McCoy Tyner, piano; Addison Farmer, bass; Lex Humphries, drums. From the first notes of "Serenata" (transformed into 6/8 for the melody statement), it is apparent that Benny Golson's voicings gave The Jazztet its own personality. Golson and Art Farmer take two cooking choruses apiece (in 4/4), often backed by arranged horn riffs; clearly this is not a loose jam session. Gershwin's "It Ain't Necessarily So" is given a struttin' rhythm by Lex Humphries behind fine spots for Curtis Fuller, a muted Farmer, and McCoy Tyner before the theme fades. In contrast, the melody of the Al Jolson standard "Avalon" is not even hinted at until its final chorus which is preceded by torrid two-chorus solos from an already recognizable Tyner, Fuller and Golson (who really tears up the chord changes). Art Farmer's interpretation of "I Remember Clifford" (the classic tribute to the masterful Clifford Brown who Art had sat next to in Lionel Hampton's trumpet section) is so melodic that it is difficult to recognize exactly where Farmer varies (ever so slightly) from the theme. The celebratory "Blues March" gives the two brassmen solo space between drum breaks. One can imagine the Jazztet romping on this piece for ten minutes without any loss of momentum. For the uptempo "It's All Right With Me," Curtis Fuller was turned loose and his seemingly effortless flurries of ideas would even make his idol J.J. Johnson proud to have recorded; catch Curtis' "Frosty The Snowman" quote! 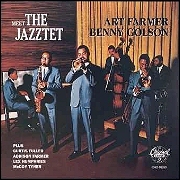 The obscure Golson ballad "Park Avenue Petite" shows off the beauty of Art Farmer's tone, Art's "Mox Nix" allows each of the horns and Tyner a chance to improvise on a fast minor blues and a tasteful "Easy Living" is a ballad feature for Golson. To close Meet The Jazztet, there is the initial (and arguably best) recorded version of "Killer Joe," complete with a spoken introduction from its composer. --SCOTT YANOW, from the liner notes.